Neo-psychedelia is a broad subgenre of alternative/indie rock that originated in the 1970s as an outgrowth of the British post-punk scene. Its practitioners drew from the unusual sounds of 1960s psychedelic music, either updating or copying the approaches from that era. After the post-punk bands, neo-psychedelia flourished into a more widespread and international movement of artists who applied the spirit of psychedelic rock to new sounds and techniques. Neo-psychedelia may also include forays into psychedelic pop, jangly guitar rock, heavily distorted free-form jams, or recording experiments. 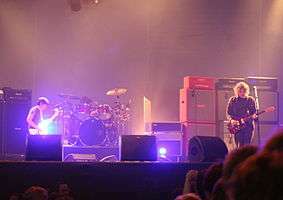 A wave of British alternative rock in the early 1990s spawned the subgenres dream pop and shoegazing. For more details on this topic, see Psychedelic music. AllMusic states: "Aside from the early-'80s Paisley Underground movement and the Elephant 6 collective of the late 1990s, most subsequent neo-psychedelia came from isolated eccentrics and revivalists, not cohesive scenes." They go on to cite what they consider some of the more prominent artists: the Church, Nick Saloman's Bevis Frond, Spacemen 3, Robyn Hitchcock, Mercury Rev, the Flaming Lips, and Super Furry Animals. According to Treblezine's Jeff Telrich: "Primal Scream made [neo-psychedelia] dancefloor ready. The Flaming Lips and Spiritualized took it to orchestral realms. And Animal Collective—well, they kinda did their own thing." ↑ One American band who labelled themselves "acid punk" was Chrome. The band's Helios Creed remembers that music journalists at the time considered about ten bands – including Chrome, Devo, and Pere Ubu – to be the "top ten" of acid punk: "They didn't want to call it psychedelia, it was New Wave psychedelia". ↑ Contemporary writers like Jon Savage saw the experimental and radical musical deconstructions of groups like Devo, Throbbing Gristle, Siouxsie and the Banshees, the Slits, and Wire as "post-punk" maneuvers. ↑ He says that the arrival of guitarist John McKay in Siouxsie and the Banshees in 1977, Magazine's album Real Life (1978), and Wire's new musical direction as factors in this starting point. Journalist David Stubbs wrote that Siouxsie and the Banshee's music in 1982 had got "neo-psychedelic flourishes" with "pan-like flutes" and "treated loops". ↑ Reynolds surmised that Echo & the Bunnymen's "tuneful" music could be likened to "two other leading postpunk groups to come from Liverpool during this period: Wah! Heat, with their ringing chords and endless crescendos, and the neopsychedelic outfit Teardrop Explodes, whose singer, Julian Cope, described the band's songs as 'cries of joy.'" He also notes that Echo & the Bunnymen were heralded as the harbingers of "new psychedelia", he writes, "despite the fact that in those days they never ingested anything more deranging than pints of ale". The band's manager, Bill Drummond, said: "All that postpunk vanguard stuff, we'd just think that was completely stupid." 1 2 3 4 5 6 7 8 9 10 11 12 13 "Neo-Psychedelia". AllMusic. n.d.
1 2 3 Terich, Jeff. "10 Essential Neo-Psychedelia Albums". Treblezine. ↑ Morse 2009, p. 144. ↑ Smith 1997, p. 138. ↑ Morse 2009, pp. 144–145. 1 2 3 Shaw, Greg (Jan 14, 1978). "New Trends of the New Wave". Billboard. Retrieved 23 November 2015. ↑ Grushkin, Paul (1987). The Art of Rock: Posters from Presley to Punk. Abbeville Press. p. 426. ISBN 978-0-89659-584-2. ↑ Cateforis 2011, p. 9. ↑ Reynolds 2005, p. 283. ↑ Barr, Stuart (1993). "Helios Creed". Convulsion. ↑ Cateforis 2011, pp. 10, 27. ↑ Cateforis 2011, p. 26. 1 2 Heylin, Clinton (2006). Babylon's Burning: From Punk to Grunge. Penguin Books. p. 460. ISBN 0-14-102431-3. .
↑ Stubbs, David (June 2004), "Siouxsie and the Banshees - A Kiss in the Dreamhouse reissue", Uncut . David Stubbs wrote that this concerns Siouxsie and the Banshees album A Kiss in the Dreamhouse. 1 2 3 Reynolds 2005. ↑ Hann, Michael (16 May 2013). "The Paisley Underground: Los Angeles's 1980s psychedelic explosion". The Guardian. ↑ S. Reynolds, "It's the Opposite of Rock 'n' Roll", SPIN, August 2008, pp. 78–84. ↑ "Shoegaze", Allmusic, retrieved 26 January 2011. Reynolds, Simon (2005). Rip It Up and Start Again: Postpunk 1978–1984. London: Faber and Faber. ISBN 978-0-571-21570-6.